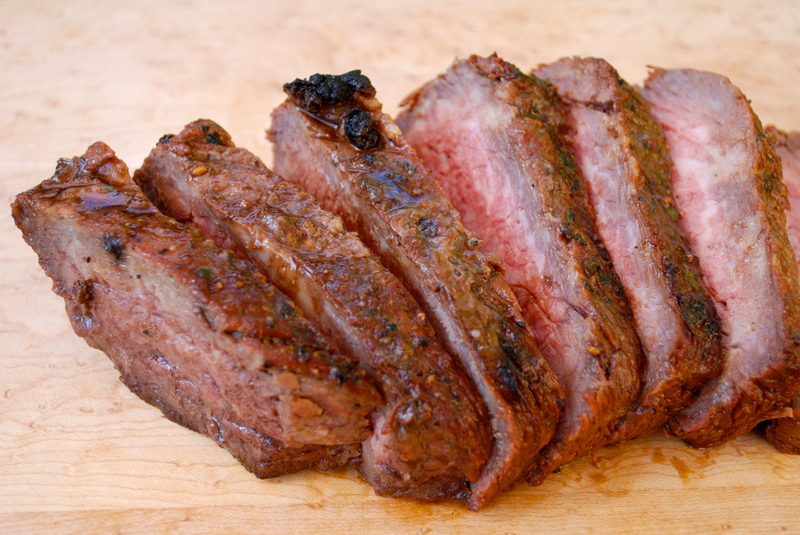 A Really Good Tri-Tip Marinade | Time to Cook! I’m always looking to try a new steak marinade and this one is delicious. Tri-tip is a wonderful cut of meat for grilling — it’s less expensive than rib eye and very tender and full of flavor. I did have to buy malt vinegar for this recipe, which I found at Whole Foods. Note: I used less garlic than the recipe calls for – 2 tablespoons seemed like so much! Recipe from blog The Kitchn. A nice piece of trip-tip, anywhere from 1.5 to 4 lbs. In a saucepan, mix together 1/4 cup of the sugar and 1/4 cup of the water and bring to a boil, stirring all the while. When the sugar gets a dark color, add the spices and stir. Bring back to a boil for a minute, and then add the vinegar, the other 1/4 cup of water, the soy sauce, and the fish sauce. Mix well and taste. If you feel like it needs more “balance,” add a little more salt. Add the garlic and the 2 tablespoons of sugar. Bring back to a boil, stirring, until the sugar dissolves. Let cool. This can be cooked on the grill or roasted in the oven. If roasting in the oven, do it at 425 degrees F and stick a meat thermometer in. When it reaches an internal temperature of 128 degrees, remove from the oven and let it rest for 10 minutes before carving.